PARIS — Alain Le Yaouanc’s work was once shown with the greats — among Mirós, Max Ernsts, Picassos and Giacomettis. He was a close friend of the author Louis Aragon and hailed by the poet Alain Bosquet as one of France’s greatest artistic geniuses. But that was a while ago. In recent years, lost in his own creativity, isolated in his studio and forgetful of the world and the realities of survival, the 74-year-old artist stopped showing and his work stopped selling. On Wednesday, after some financial setbacks, he is to be evicted from his home and studio of nearly 50 years. Many, including the city of Paris, are worried that Mr. 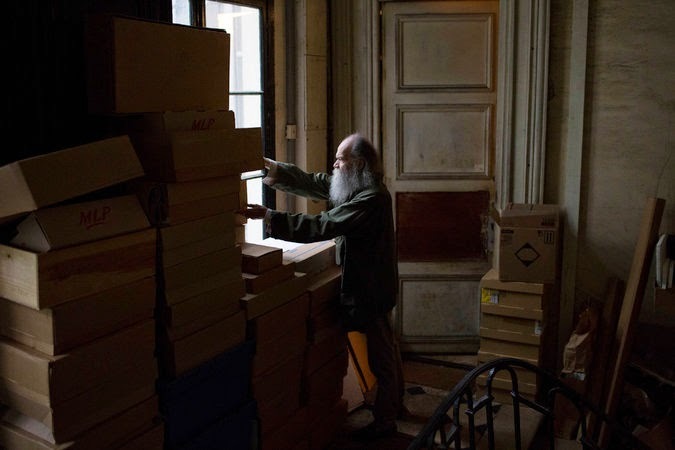 Le Yaouanc’s plight is endangering his works, a rich part of France’s 20th-century cultural legacy, and the authorities are trying to find a way to make sure that none of the paintings, sculptures, collages and other objects piled up in the 1,000-square-foot-space are lost or damaged. As for himself, Mr. Le Yaouanc (pronounced yah-WONK) says he is not leaving, that the authorities will have to carry him out, and this is no idle threat. In July 2013, when he first faced eviction, he locked himself in and threatened to kill himself. His son, in tears outside, persuaded the local authorities to give his father more time. It all started a decade ago, after Mr. Le Yaouanc took out a loan of 123,000 euros, around $160,000, from a Belgian bank to send a massive marble sculpture of his from Texas to Beirut, Lebanon, as a gift to the city. He used his apartment as collateral but soon found himself unable to repay the loan. A Lebanese friend assumed the loan, but on the condition that Mr. Le Yaouanc agree to sell the apartment to his creditor for €700,000, or about $900,000, in the event of default. After a series of bad financial decisions, Mr. Le Yaouanc lost everything, including the apartment, now estimated to be worth at least €1.25 million, or $1.6 million. The city offered him a small apartment, but he turned it down because it could not hold even a tenth of his artwork, he said. Now, he has a few days to pack up, not nearly enough time, he says, to move and relocate decades of artwork. Originally from Alençon, in Normandy, he says he has sacrificed his life to his work in this apartment in the Marais, the epicenter of bourgeois bohemian. It is so crammed that natural light no longer finds its way inside. His bed is nestled in a dark corner among hundreds of paintings, sculptures and collages. Moving 50 years of an artist’s work is no easy task, said Houda Kabbaj, 29, a photographer and architect who has been helping Mr. Le Yaouanc pack up, 14 hours a day. Moving poses multiple challenges. It has to be overseen by the artist and carried out by people trained in handling precious artwork. Each of the pieces, many of them quite fragile, has to be cataloged and carefully packed in a safe container. Ms. Kabbaj met Mr. Le Yaouanc at Le Felteu, a traditional Parisian bistro in the Rue Pecquay, where he eats every day. Brigitte Agnona Peheaa, the owner of Le Felteu, has been feeding him free for 10 years. She lets him bring his own knives and spices and bottles of wine. A fan of Goya and Ernst, whom he considers to be one of the smartest painters ever, Mr. Le Yaouanc began his career in the United States, moving there in 1956, first to Maine for language study and then, in 1958, to New York, where he attended the Art Students League. His first American exhibit was at the Mattatuck Museum in Waterbury, Conn., in 1957. He admits that his difficult personality may have been a major source of his troubles. His son Allen, a web consultant based in Brussels, says his father might have benefited more if he had played the gallery game and been more flexible about his art. Mr. Raffaud, the deputy mayor’s aide, said Mr. Le Yaouanc had received special treatment from the city, where evictions are usually a lot swifter. The Ministry of Culture is also about to provide a few thousand euros to help the artist move his work to a space lent by a friend of the family. Mr. Le Yaouanc is still hoping for an extension on his moving deadline so he can continue his work in peace.